PRIMER, ACRYLIC PAINT, AND URETHANE ON MAGNESIUM ALLOY, 10 7/8" BY 9 1/8"
This work of art has a fairly cool story behind it. In March 2001, I purchased a new Sony VAIO (pronounced "vigh-oh", rhymes with "bio") PCG-R505TSK laptop computer... I've had quite a few Sony laptops over the years, and am a big fan of them. Anyway, in May 2001 I went on a trip to Seattle to see a show of new work by David Huchthausen, which included Implosion Sequence DRH93W. Combined with its docking station, the new laptop was too large to fit into the protective sleeve I use when carrying my laptop around, so I put the laptop straight into my backpack. It was during this time that something in the backpack put a very large, and very annoying, scratch on the laptop's case. Nothing I tried, and nothing David Huchthausen could think of, could get rid of the scratch... I tried nail polish, colored pens, and even light sandpaper to try to buff out, conceal, or polish out the scratch. Needless to say, I was rather unhappy about the scratch, so I decided that the only way I'd be satisfied was to replace the laptop's case. I called Sony and ordered a replacement case, which I installed myself. At this point, I had an extra case with a large scratch on it that was in every other way still usable. Suddenly, I was inspired: Why not cover up the scratch with a painting? Since I know Bob Rankin quite well, I called him up and explained my idea to him... he had never done anything like it before, but we had nothing to lose, so he said he'd give it a shot. I told him that I really liked one of his paintings that he's kept for himself, a very large abstract canvas, and asked him to paint something in the same style. This is the result. When I received the case back from Bob, I reinstalled it on my laptop... it looks very cool, and quite a few people have told me that they think it's an excellent idea. 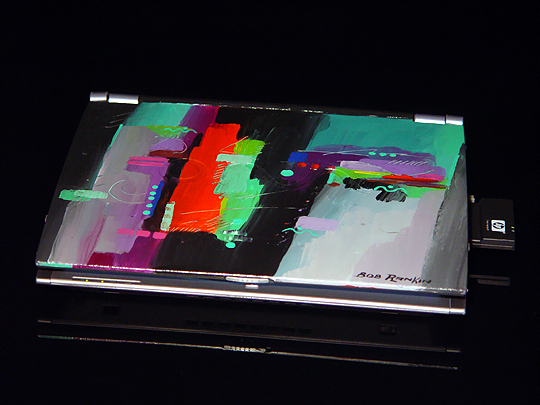 This is the only laptop I've ever seen that incorporates a work of art... I'm not sure it's an idea that works for everybody, but it sure works for me.